Snake’s Head Fritillary – Dig Delve – An online magazine about gardens, landscape, growing & making. 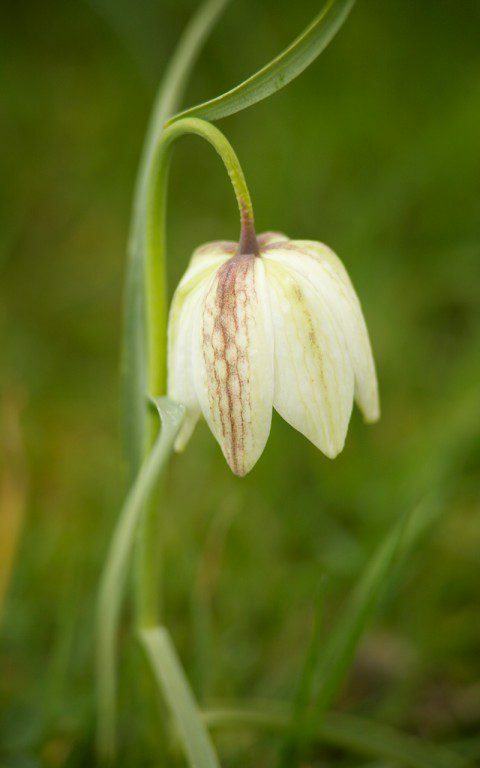 Come the first two weeks of April, with the first of the cherry blossom billowing, the snake’s head fritillary will be pushing above the fresh shine of new grass. 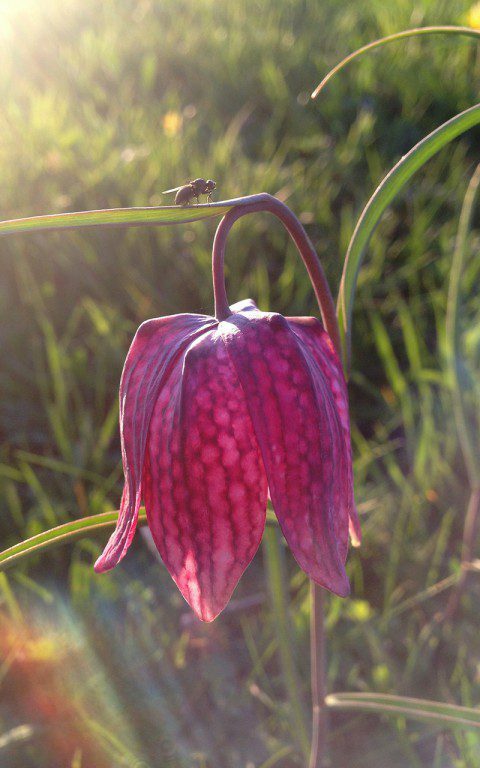 It is of some debate whether Fritillaria meleagris are actually native to Britain – some say they were introduced by the Romans – but they have a number of secure strongholds in this country and, if you can find the time to visit one, you will never forget it. In my opinion, these humble bulbs look best when naturalised and growing in moist turf. I first saw them en masse at the water meadows of Magdalen College in Oxford, where in wet years such as this they are often submerged as the river rises in winter. 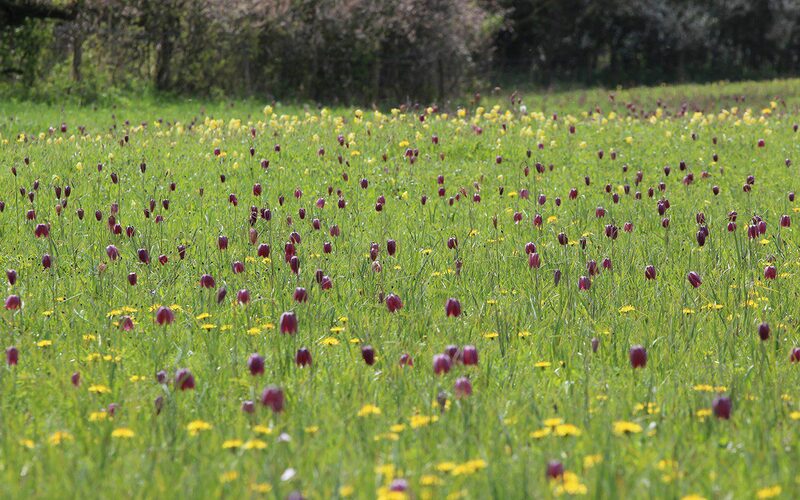 Damp ground is their favoured haunt and last spring neighbours took us to see the flood meadows at Clattinger Farm in Wiltshire where they are naturalised. This early in spring the grass was still short after being cropped tight over winter, but you could already see how the plants were colonising the ground to find their place. The wet hollows were marked by meadowsweet, the shadier margins by meadow rue and, tracing the gentle elevations in the ground where they obviously favoured the conditions, a sea of cowslip and fritillary. The meadows are maintained as an SSSI (Site of Special Scientific Interest), with the hay cut made in mid-July, followed by grazing over the autumn and winter to keep the turf short. The soil fertility is diminished through the removal of the hay which, in combination with the grazing, allows for diversity in the meadow. When you see them in their thousands, occasional white sports catch the eye, but the greater majority are the familiar thundery soft purple or paler mauve with deeper chequering to the petals. When naturalised they never grow in clumps, so each flower hangs pendant in its own space. Their wire thin stems are almost invisible and arch at about a foot, the flower held with bowed head above the young meadow. This distance between grass and flower is magical at this time but, as the petals drop, the plants vanish as the meadow rears up to engulf them. You will be hard pressed to find them again until next year, but if you do find the seedpods they stand distinctly upright like a little drumstick. Seed is light and will be caught some distance on wind. It is best sown fresh and it will not germinate until it has had a winter freeze. Despite their delicacy, Fritillaria meleagris are as reliable as bluebells if they like you and finding them a place where they can do their best is worth the hunt. As a general rule, nearly all bulbous plants need a minimum of five to six weeks after they flower to photosynthesise and build up reserves and fritillaries are able to do this as the meadow matures and goes to seed. Emulating these conditions in the garden is not too difficult if you have an area where the grass can be allowed to run long in the first half of summer. You can grow Fritillaria meleagris very successfully in pots if they are kept in a damp corner on the north side of a house whilst they are dormant, but there is nothing better than seeing them seeding into a position they favour. This may well be out in the open or under deciduous trees where there is plenty of spring light. Inspired by last year’s trip, I planted a couple of hundred Fritillaria meleagris alba – the white form – on my crab apple bank behind the house. As is the way, I have not been supplied with quite what I asked for, as there are some rogue darker flowers, but I am happy to have them as their chequered markings are so much part of their charm. The crab apple banks are where I have been experimenting with naturalised bulbs and they are flowering this year with Leucojum aestivum, the jonquils and the diminutive Narcissus ‘Hawera’. When planting as autumn bulbs I have always had better success on damper, heavier soils, but they will grow well anywhere as long as the ground doesn’t bake in summer. A general rule of thumb is that bulbs should be planted at 2½ times their own depth, but planting deeper – up to 15cm – gives better result for the snake’s head. The bulbs are the size of a chunky hazelnut and, though I am not sure of the reason, it may well be that deeper planting puts them where the moisture is and out of reach of voles and mice. The scarlet lily beetle and rabbits are their other predators but, once you have experienced them, you will love them enough to know which come first. Seed Mix EM31 from the Clattinger Farm meadow, which contains Fritillaria meleagris, is available from Emorsgate Seeds print catalogue and will be available online soon.